It has been a while since I have posted anything 1920s here! 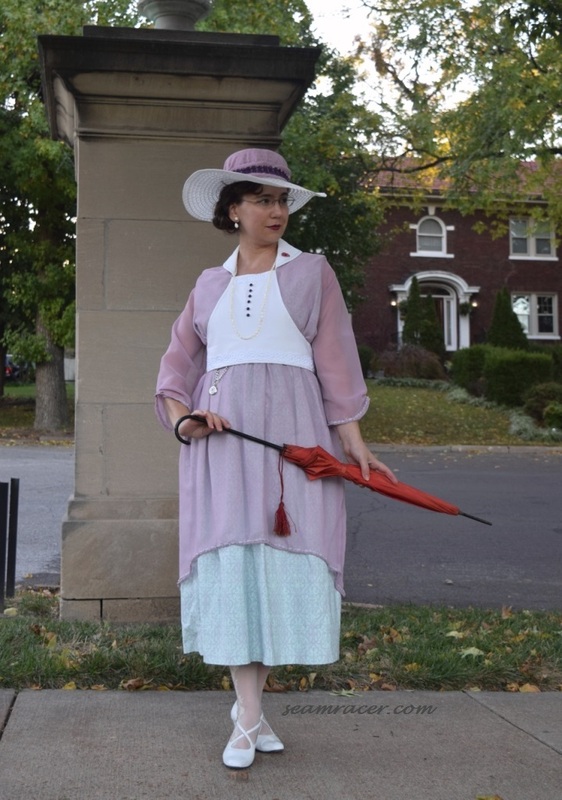 Unfortunately, part of the reason is not only the fact that the decade’s silhouettes can be hard to love on myself, but also the fact that I want something from that decade to wear today without looking like I am doing historical re-enacting. 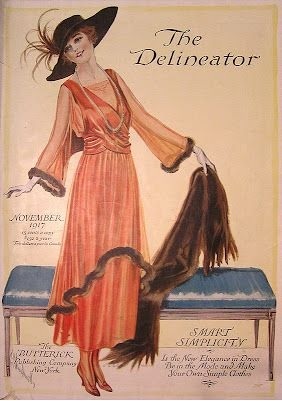 It seems to me that something pre-early 1930s can easily be obviously vintage. 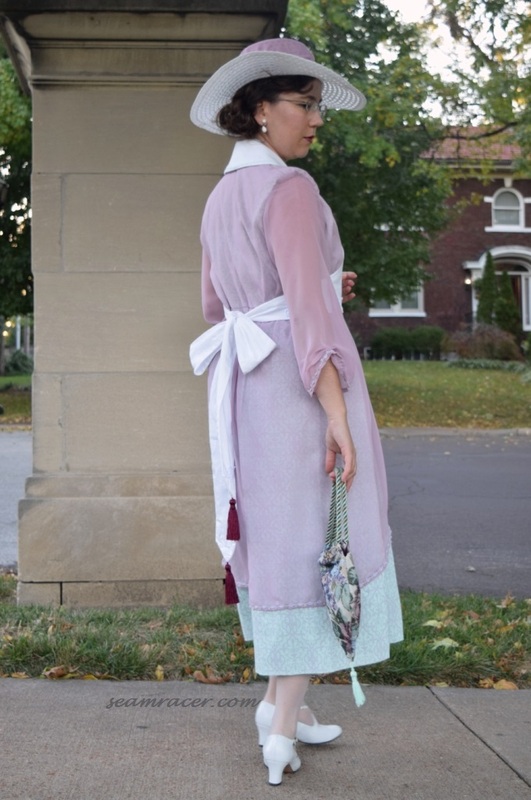 I generally love to bring my vintage style into my everyday life and wardrobe in a way that keeps it modernly appealing yet still true to the history of the decade’s fashion. 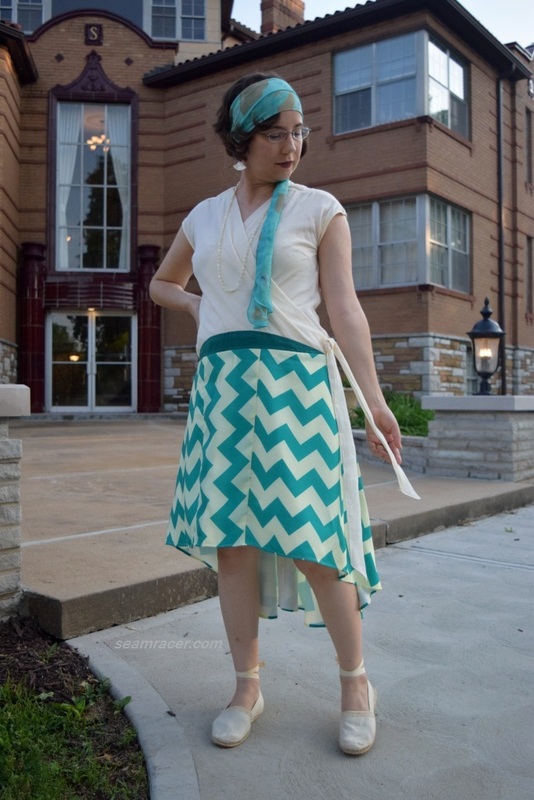 This is a hard balance to find all the time, which is why you don’t see as much 1920s things in my list of makes…and also why I am posting (with great excitement) about my newest Burda Style dress! I somehow feel like life is so much more fun, free, and easy in this dress. 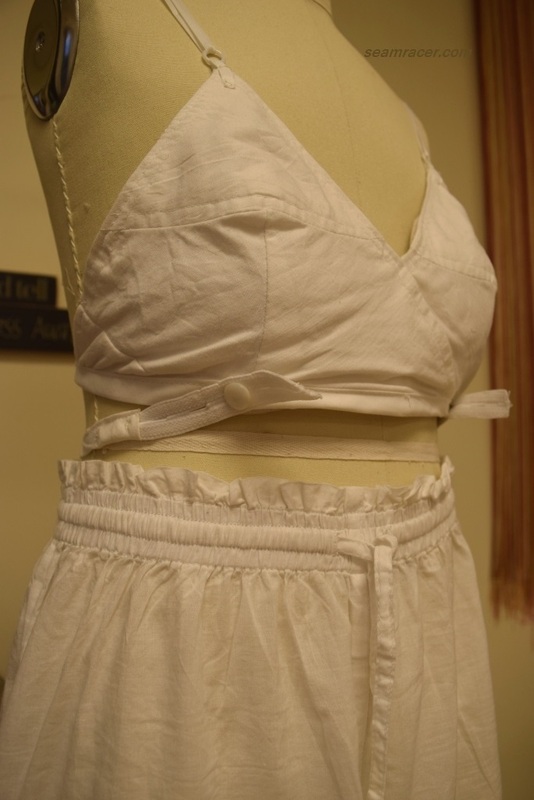 There are no closures (zippers, or the like) needed with the bias crossover bodice. 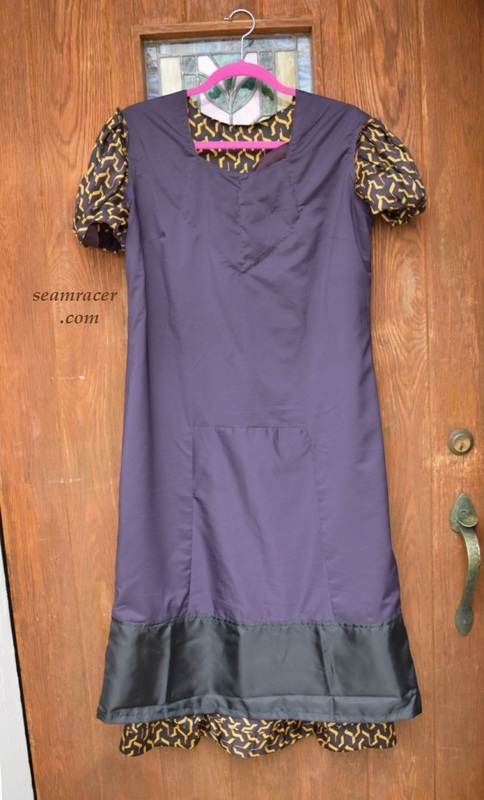 It is a popover dress that is flowing, comfy, unconfining, and freshly different. I absolutely LOVE the garment make of mine. It embodies the late 1920s crazed hype that lived life to its fullest – and foresaw many of the modern conveniences (television, computers, etc.). The late 20’s overdrive (1927 to the crash of 1929) produced both short above-the-knee skirts and many avant-garde inventions that would not been seen for many decades later. 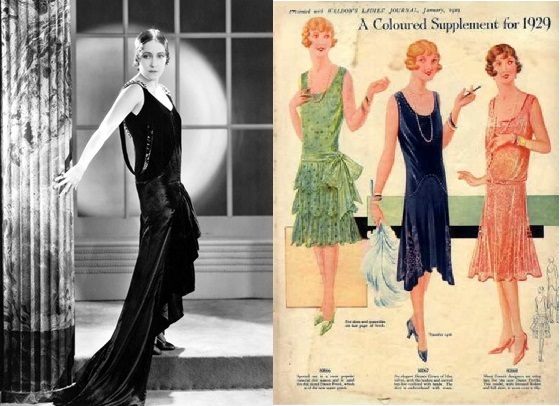 This era of the 20’s had an amazing modernity that I feel has been captured by this dress. 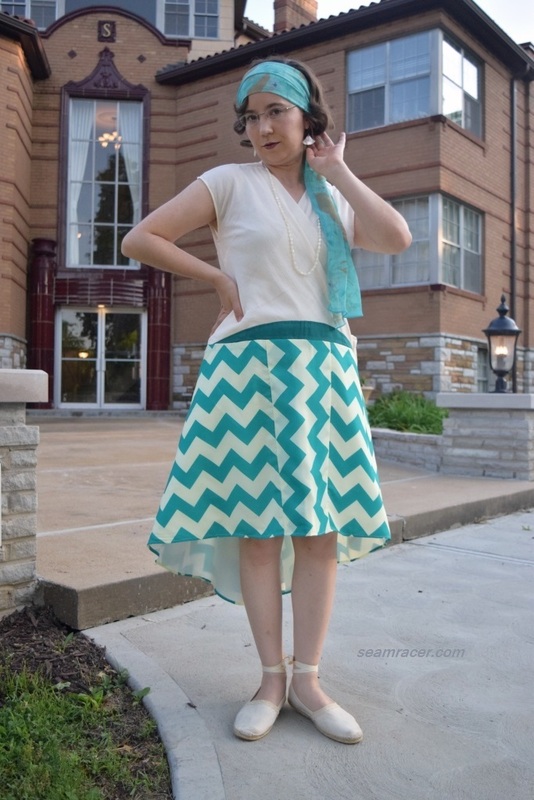 There is a zig-zag print on the skirt to pay homage to the hardened, mathematical form of Art Deco that flourished in the time. 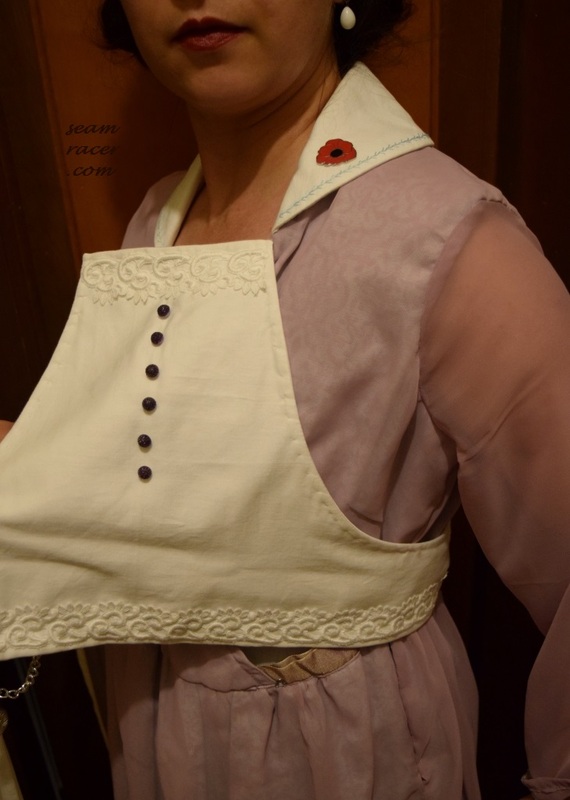 The bodice is a mock-wrap to pay homage to the popular fashions of the few years before (1926 and 1927). It’s also made from a soft textured gauze which reminds me of the lace, sheer, and interesting fabric bodices of many fashions in the 20’s. 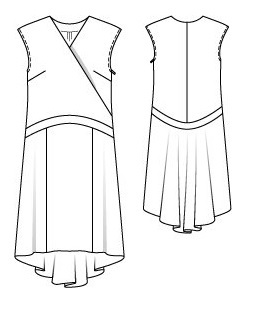 The high-low hem with a fishtail skirt ‘train’ is later, very 1927 to 1929, though (see this post for more info). All of these years are my favorites to this decade. 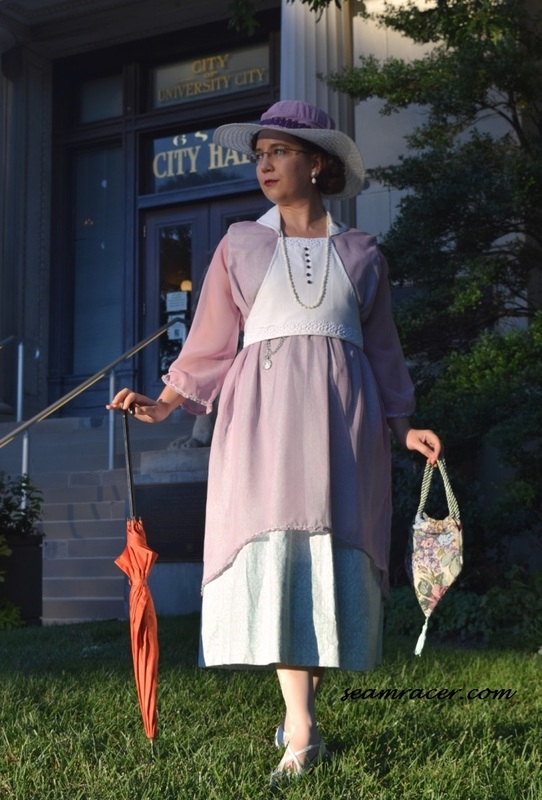 So – yes – this dress is a rather accurate combo of everything I love best in the 20’s from an unexpectedly modern source! TOTAL COST: This is a project that spanned 3 years, so I do not remember anymore but I know it didn’t cost much with 1 yard for the bodice, and about 2 yards for the skirt, with only scraps left over from these two projects (here and here) for the contrast belt. 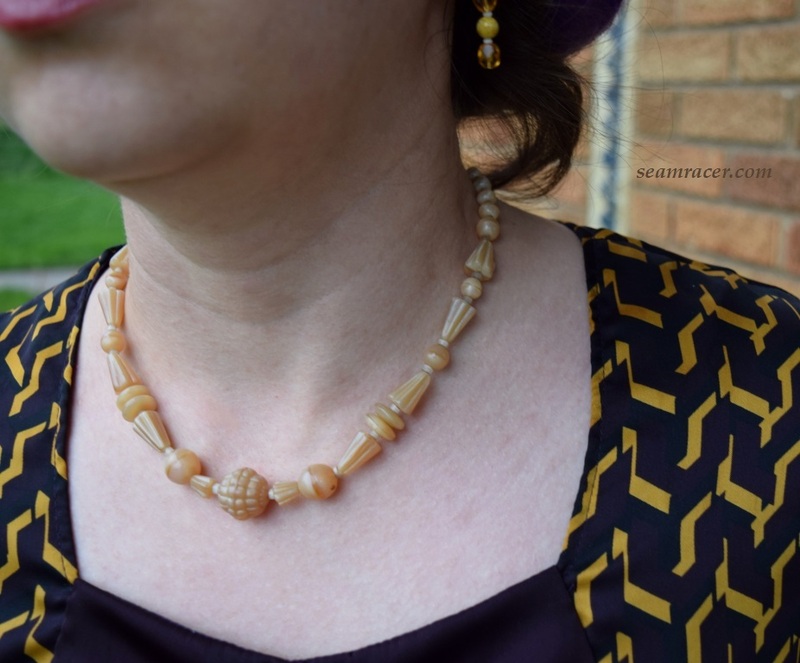 My 20’s style dress project counts for my monthly “Burda Challenge 2018”, my ongoing “Retro Forward with Burda Style” blog series, plus the “Sew Together for the Summer of the Wrap Dress” challenge. Now, you might say this is only a mock wrap and not a proper wrap dress. Well, yes and no! 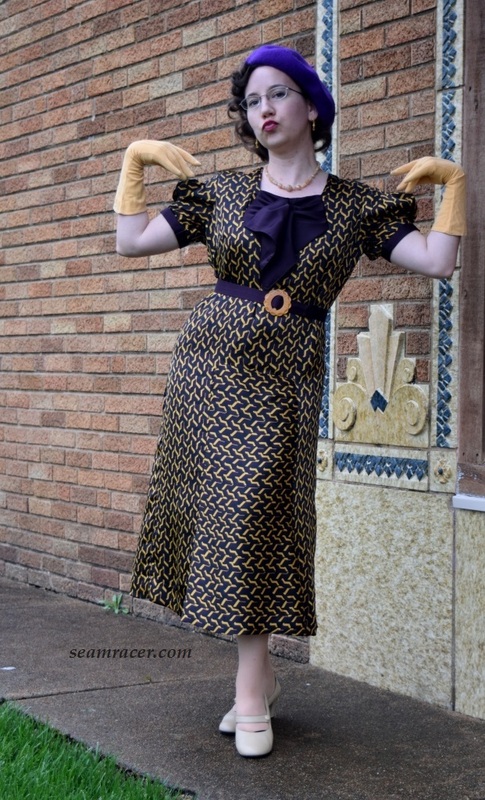 The name for the pattern is “Wrap Dress”, for the first thing. 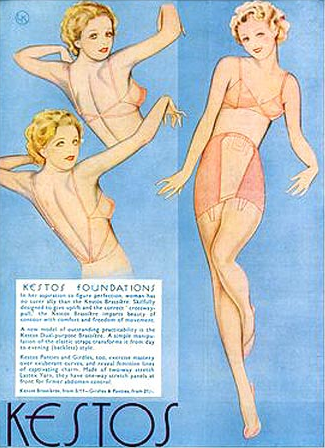 More than that, though, the full ‘lap’, cross-body, tie-on dress that we tend to think as a proper wrap didn’t quite look the same 90 years back. 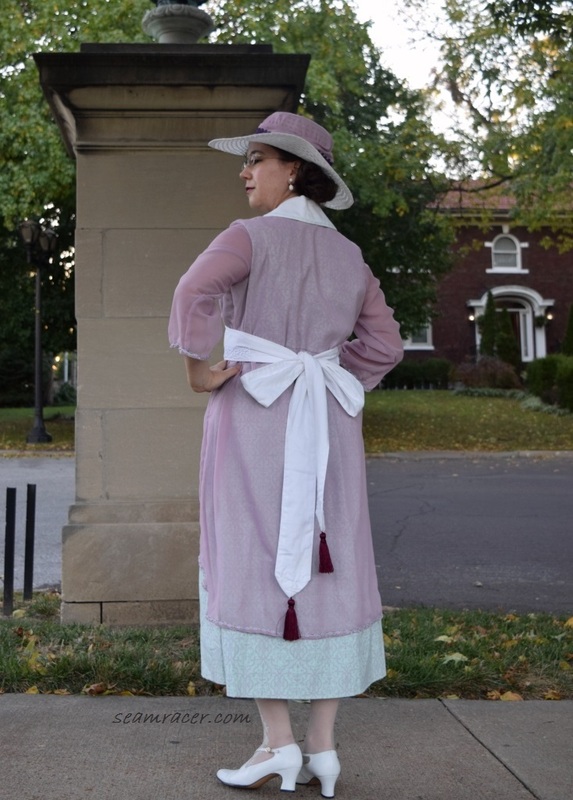 In the 1920’s, a wrap dress was a garment that was often faking it, with a cross-over bodice, a one-piece skirt, and a sash or tie of some sort on one side to continue the deception. 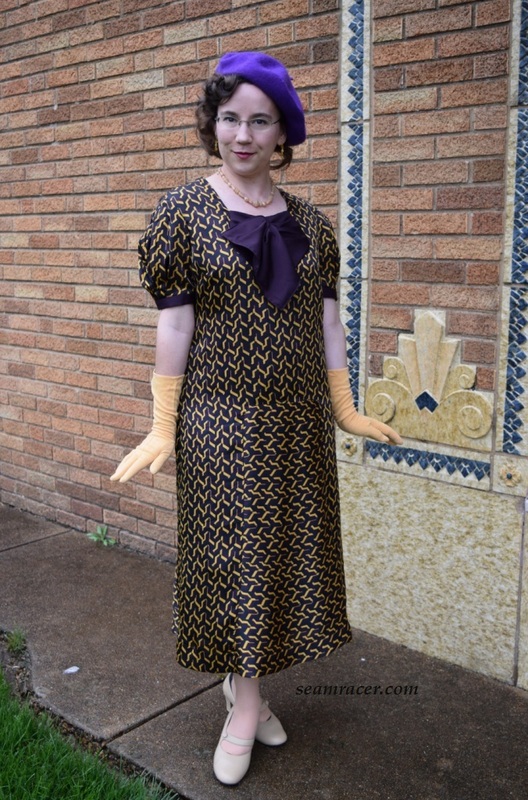 A mock wrap to us of today was a full wrap dress in the 1920’s. 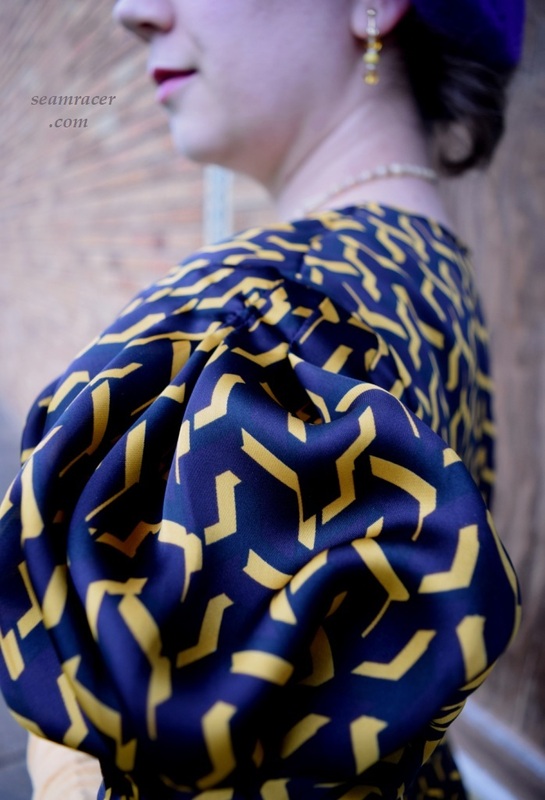 Not only this, but mock wraps were immensely popular in the decade anyway, even in the blouse or jacket form. 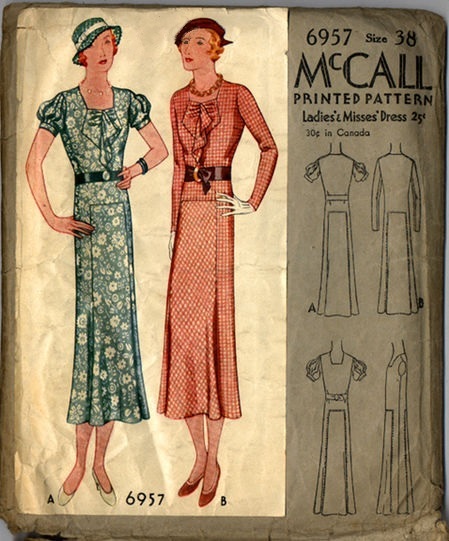 By the next decade of the 1930s, wrap-on dresses were normally a one piece, full tie on garment, closer to what we are used to today, with a caveat. 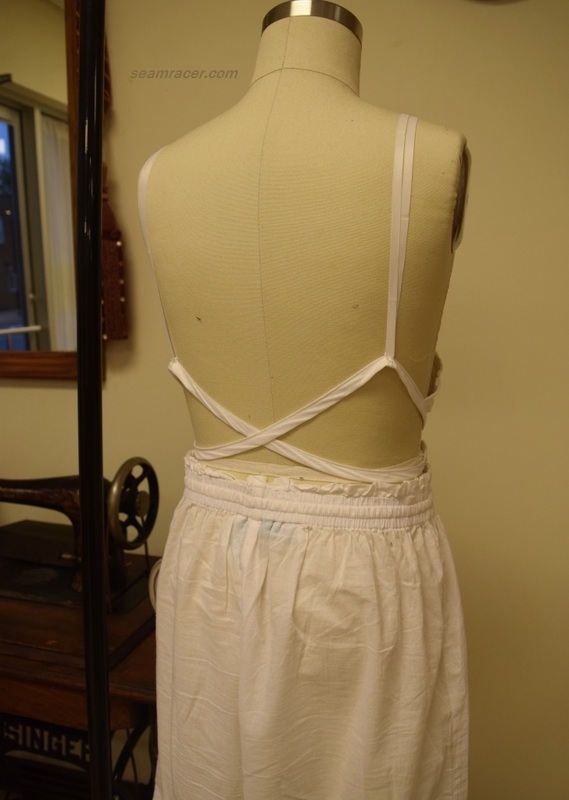 They were often reversible and considered more of an apron or pinafore like garment meant for housework or grocery errand duty…the hum-drum efforts which only result in sweat and grime appearing on one’s clothes. 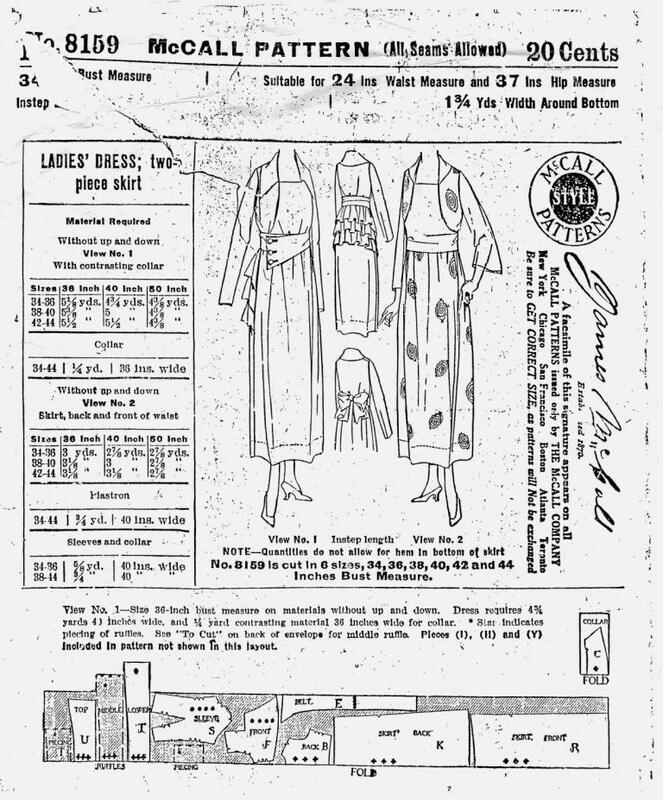 Many of these full wrap-on dresses were called “Hooverettes”, after the American president at the time of the Great Depression. 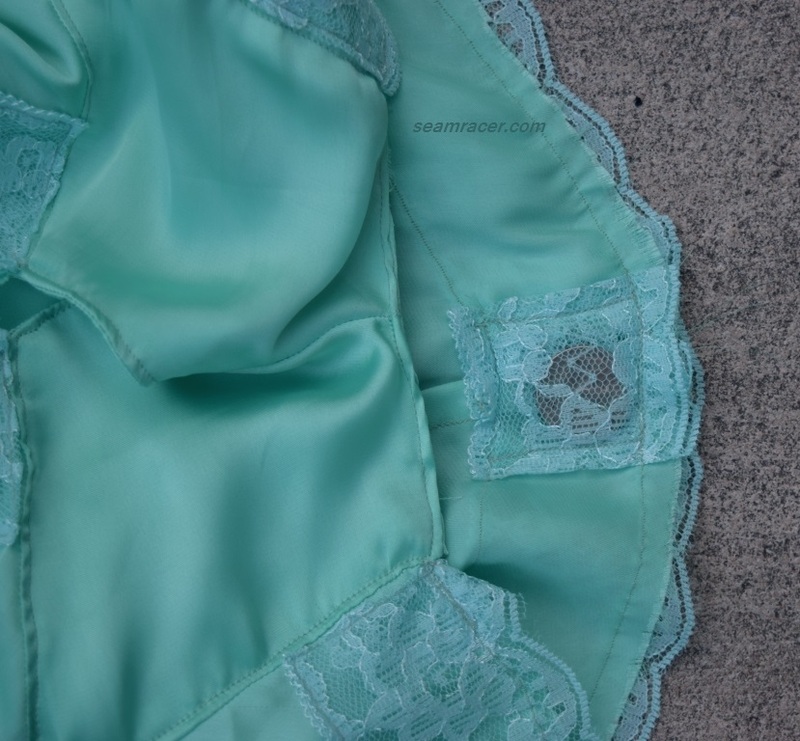 These were like a gloried robe for women to iron easily and look sensibly cute yet incredibly comfy to do all the things that the hard times required of them. 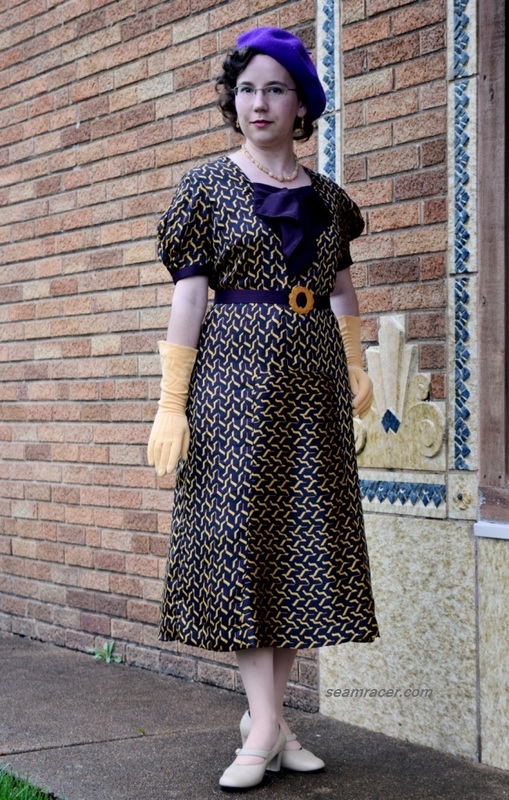 With the rationing of the 1940’s, an easy-to-make full wrap-on dress was glamorized even further to being included as possible for evening looks (with the right fabric). 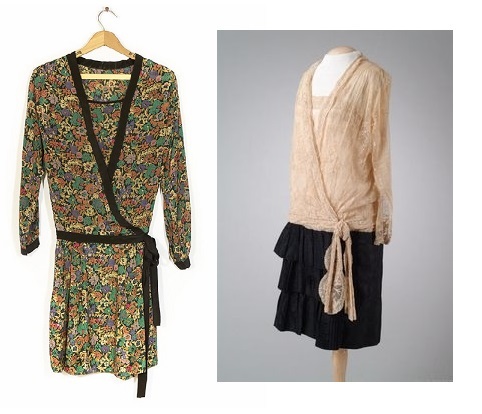 The 1950s and 60’s widely used wrap dresses with great ingenuity in many of their designs, but Diane Von Furstenberg and the trending Boho Hippy look in the 70’s democratized the wrap dress as we know it today for all shapes, occasions, and materials. Yet, according to this article, even for Ms. Furstenberg, her early “wrap dresses” started off as a cross-over top paired with a skirt! 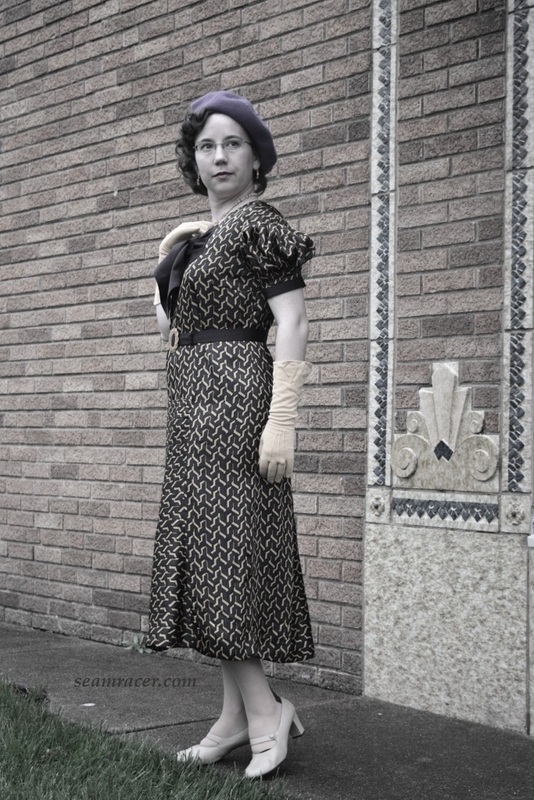 Now, for as easy as this dress is to wear and put on, it was one of my most difficult makes, especially among Burda patterns. 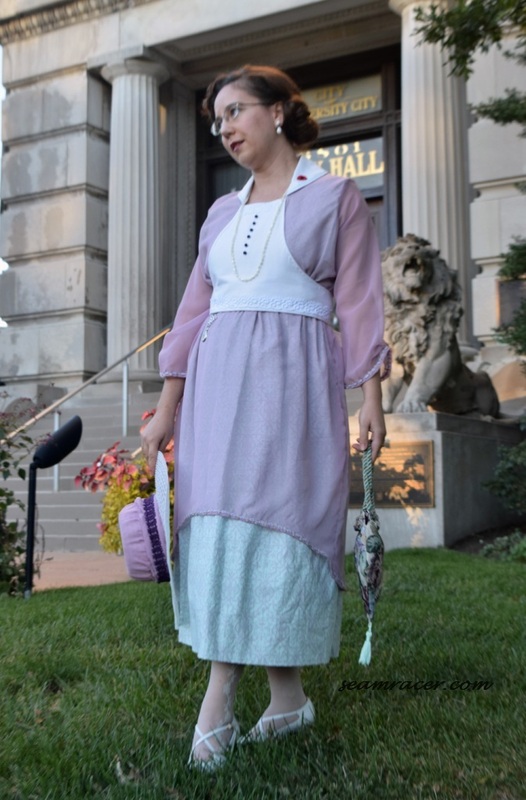 As you see the dress now, it is in its re-fashioned form. 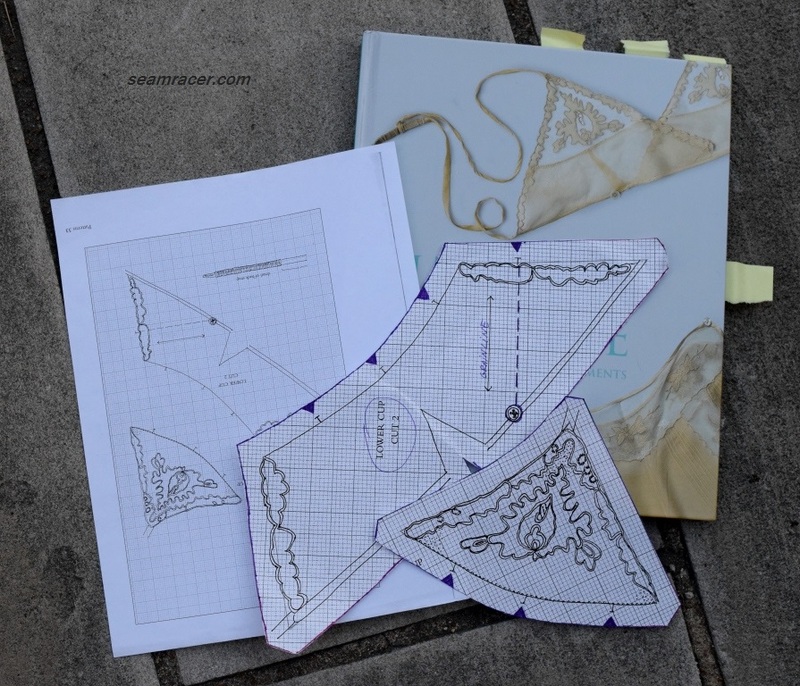 Yes, I do re-fashion my own makes…I’ll do whatever it takes to save a project and turn it into something I love! So, this dress is not the original design – very close but still slightly adapted. 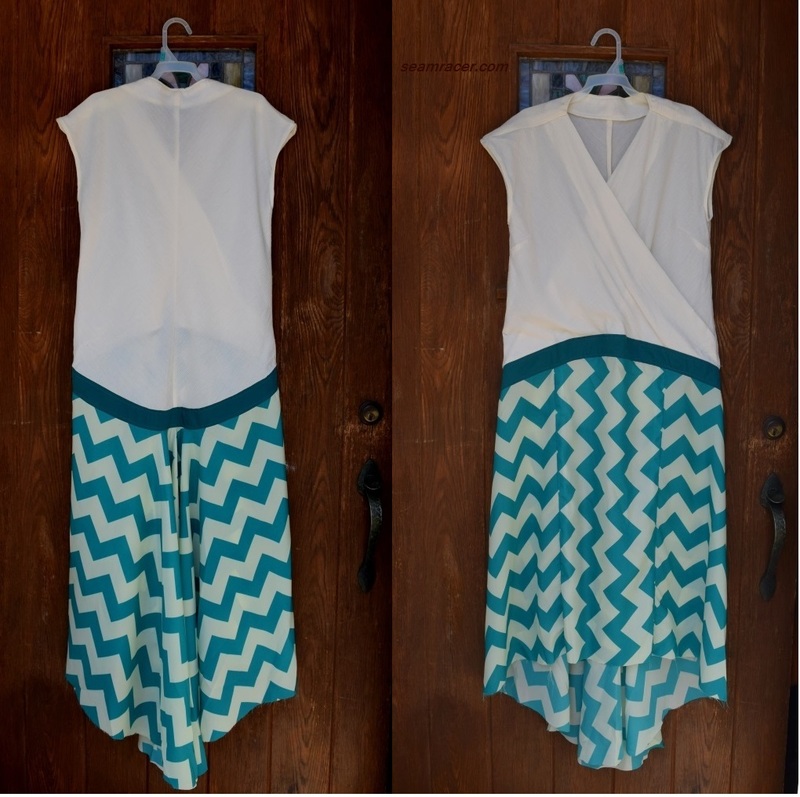 I did make the dress according to the pattern back in 2016 (at left), and it did turn out well after some difficulty with the curved, drop waistband. However, as nice it looks on the hanger, the final fit on me was less than complimentary. The gauze had more of a give/stretch than I expected, the dress’ fishtail train hung past the ground on me, and the drop waist back was way below my booty. I really didn’t like that much of the contrast waistband, after all, too. I did like the general shape, the colors I chose, and the print/texture combo. So, the dress had been saved to sit in my “projects half finished” pile (which is quite small, I can brag) for these last two years until I felt I had the right idea of how to re-work it. No wonder it feels so good to finally wear this! This dress makes shaking my booty so good looking with such a swishy skirt! A good drop waist dress should fall (in some small portion) somewhere through the hip area, slightly above the true hip line yet at least 5 inches below the true high waistline. It technically should not be much below the bend of your body when you sit, from my understanding. 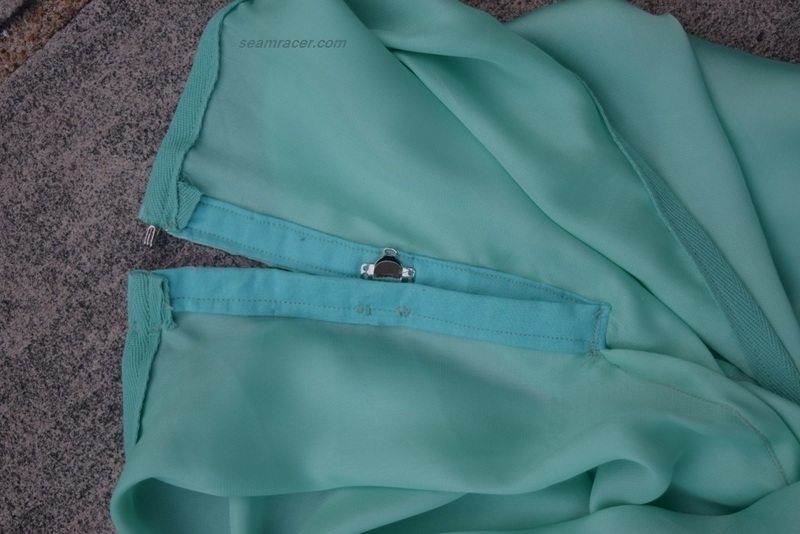 Thus, to ‘fix’ my dress, I figured on leaving the hem alone and making a new straight line (taking out the curved “belt”) across and around the mid-section, parallel to just below the bottom of the front contrast waistband. I did want to keep a small portion of the contrast “belt” to transition the two fabrics with a solid color and give the appearance of a mock half-belt panel. 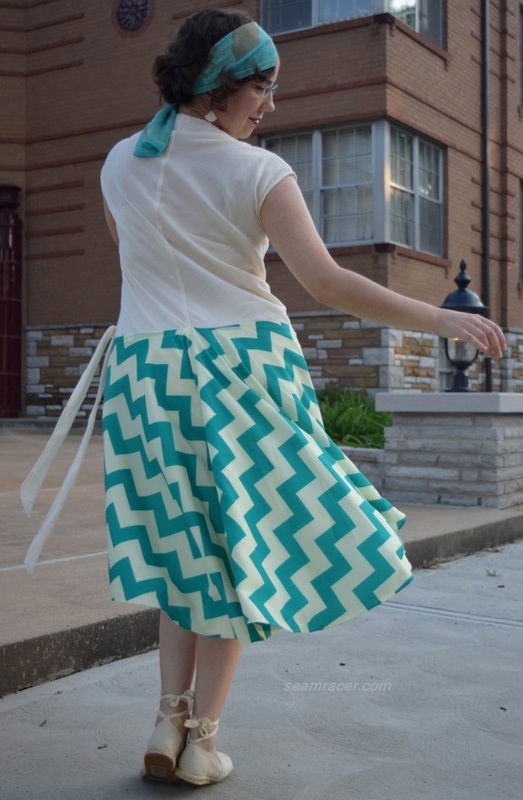 It was sure tricky to straighten out the skirt in turn around the back with that amazing bias to the skirt! 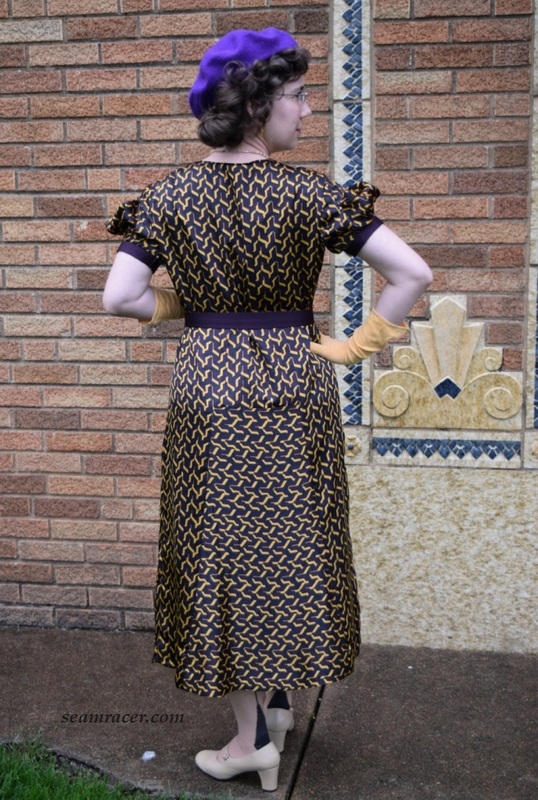 In the 1920s, the waistline traveled all over from very low to almost non-existent, but this dress’ waistline is a slightly higher, later in the decade style to match with the skirt. 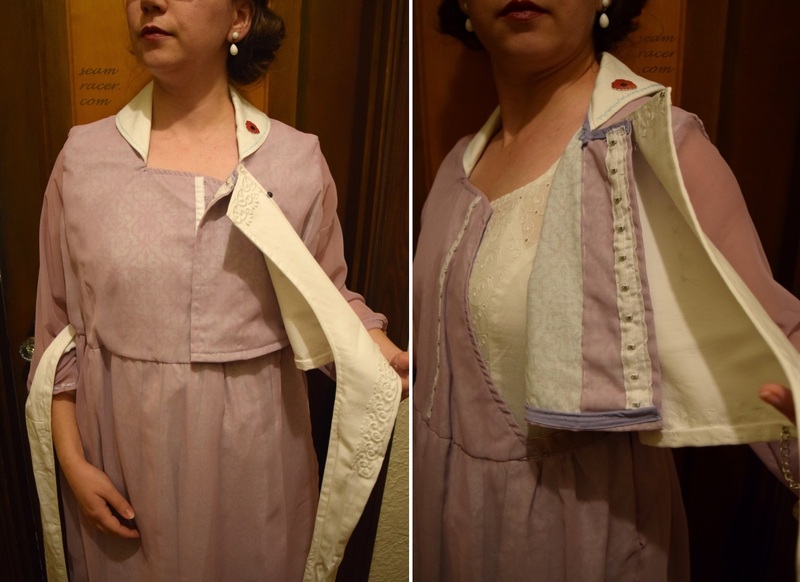 Otherwise than this re-fashion step, I kept the bodice as it was except for pulling up the shoulder seam slightly. To keep the full skirt weighted down nicely (so it wouldn’t turn wrong way up like Marilyn Monroe over an air vent) and keep it opaque, I fully lined it. This dress’ skirt does need a tiny 1/8 inch hem so that it doesn’t get stiffened at all. 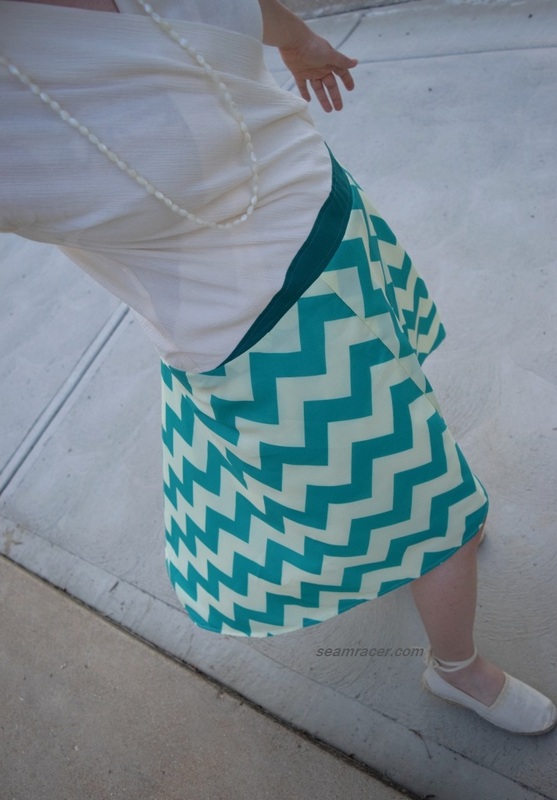 At the same time, such a tiny hem on a skirt like this was a major pain. 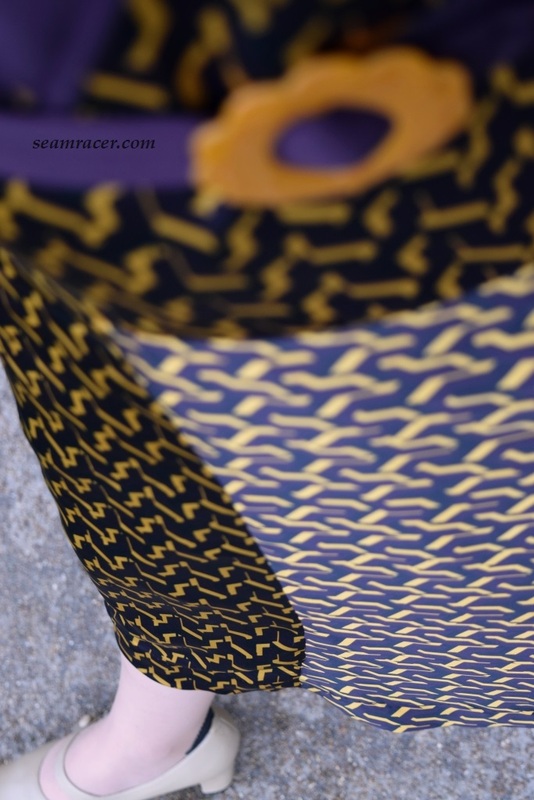 It might not be immediately obvious, but the length of hemline just seemed to keep going, and going…but all that turns out well in the end is worth it in my opinion. 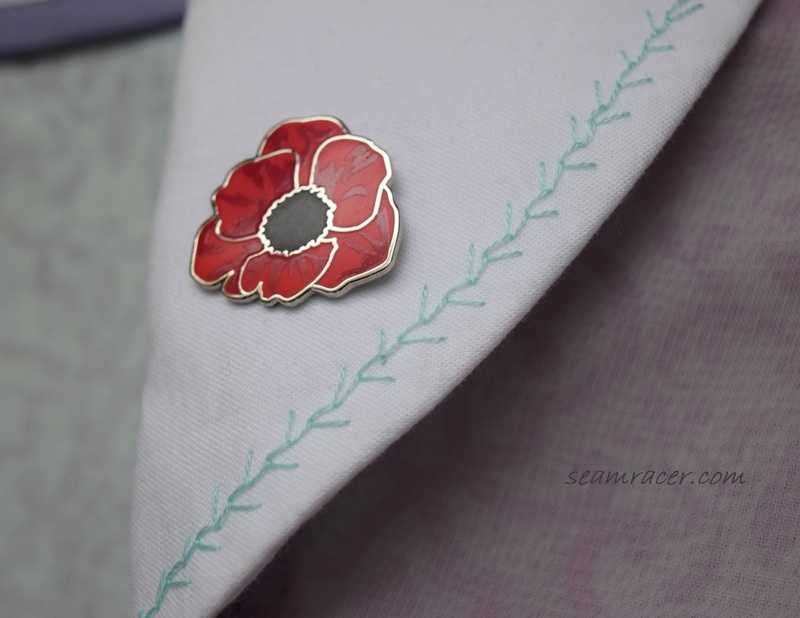 Do tiny hems wear you out and seem overly tedious like they do for me? 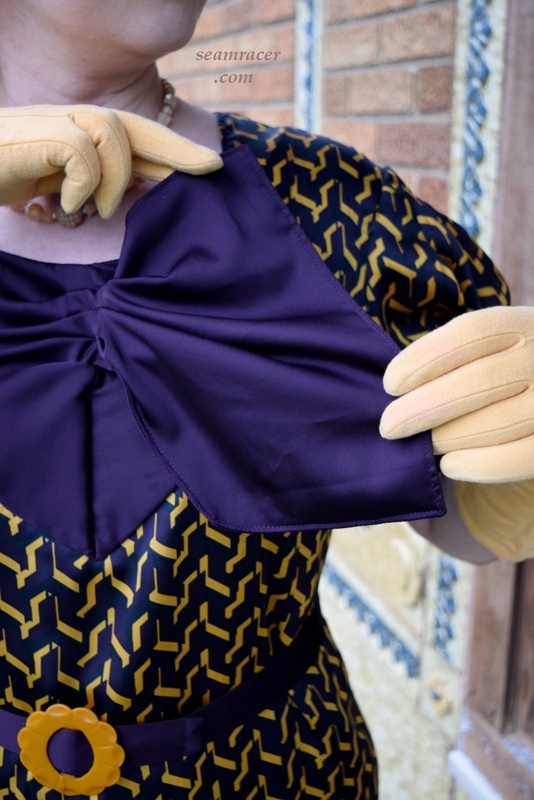 It was entirely my idea to make a long tie piece and stitch it to the left side of the bodice, thereby continuing the mock wrap dress deception! 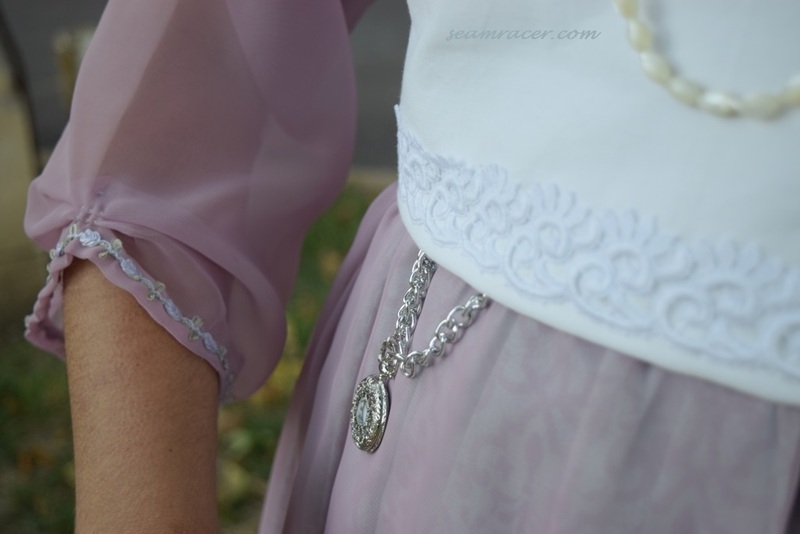 I especially like how much this little touch adds to the dress. This is again another true 1920s feature, as most of the era’s mock wraps had ties on the corresponding side to continue the illusory appearance. To me, the tie also adds a touch of asymmetric that was also so popular in the 1920s. 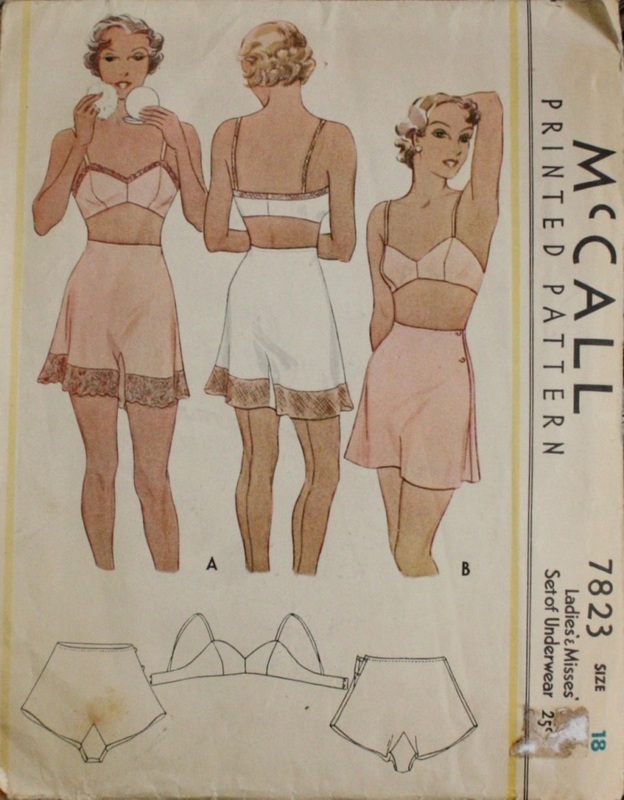 Somehow it seems so much easier for me to interpret a modern take on the 20’s when I am starting with a pattern from today, versus starting with an old original pattern. I almost always recommend others to use vintage patterns because I think that they offer so much to learn from and have better details. However, there are so many modern patterns that have veritable 1920s features if you know what to look for. This presents two interesting points. 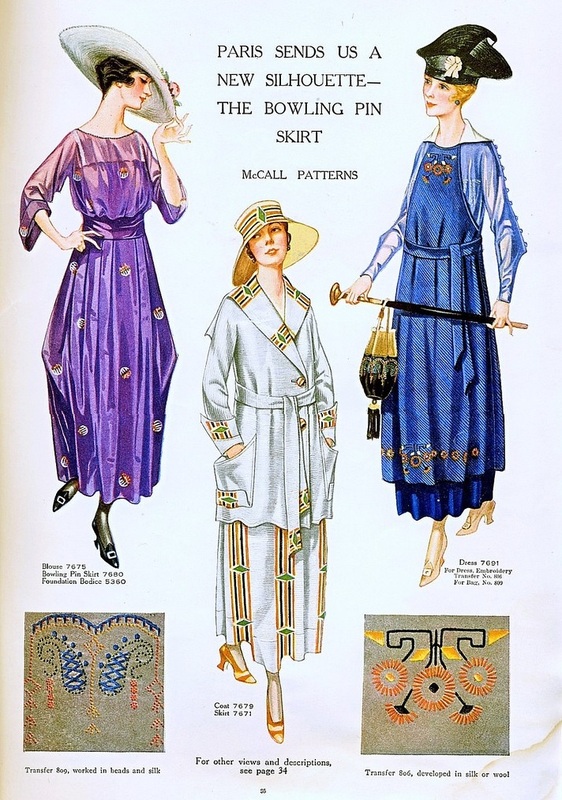 Firstly, here I am saying it’s hard to make an old 20’s pattern look modern, yet I’m also saying that many modern fashions (patterns and ready-to-wear) have very 1920s features. 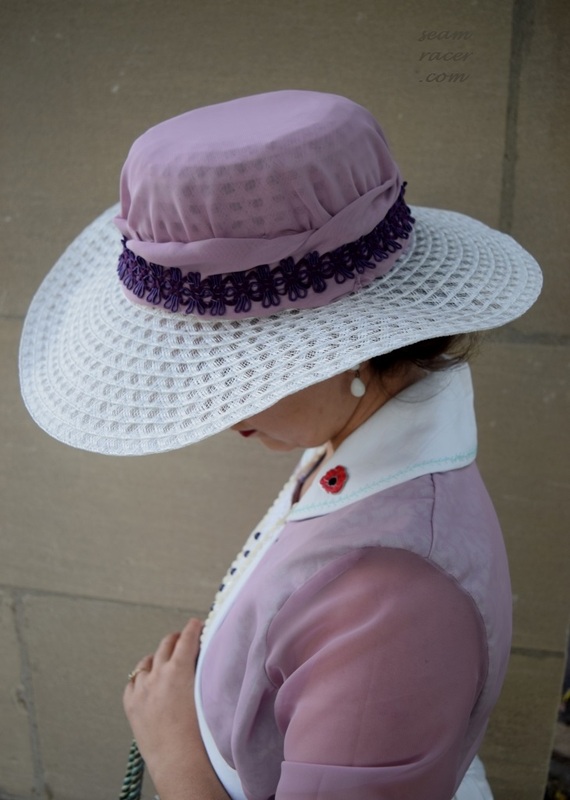 Perhaps the era between WWI “The Great War” and the Depression of the 1930s has more in common with us of today than we think. 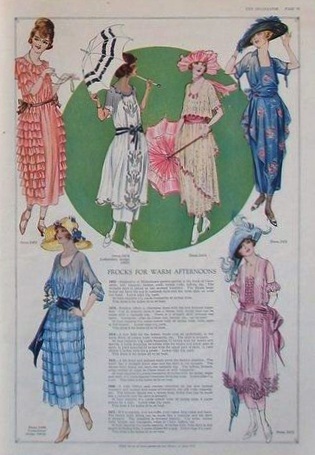 Looking at old fashion plates or extant garments might not make this as obvious as it could be…it just takes the styles of today to give us a new perspective! Secondly, this proves how important it is to pepper one’s awareness of current styles with a knowledge of fashion history. A good overall view of the big picture might just be something specific to me as others have told me, but looking around and seeing the beginning of a trend is always a good idea. Actually, style is something that seems to only be recycled over and over again the more one sees. Besides, often finding the source, or at least seeing the ways a detail is re-interpreted, is fun, interesting, and always worthwhile…not to mention the benefit of giving me more ideas for my projects! Don’t be afraid to dive into some fashion research next time you start wearing the “newest” thing and find out the reference of where it came from! Yay! I’ve reached 200 posts here on my blog! To celebrate I will offer you something that is definitely different. Here’s my very first hair tutorial to show you one of my very favorite way of achieving a curly hair style. This method of pinning or setting my hair for curls was shown to me through my good friend, who is a hair stylist, by her salon’s owner, Cecil. 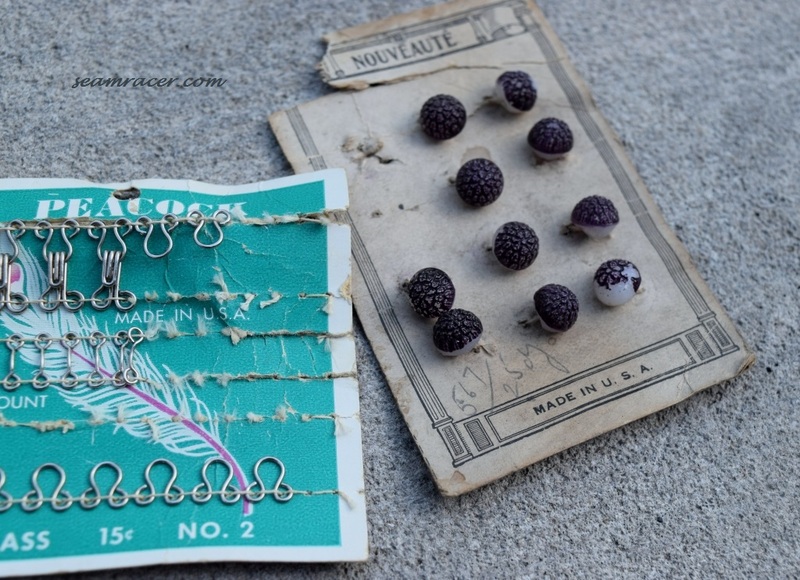 Apparently, it is the real-deal old-fashioned way that they used to do it before we women had metal, foam, plastic, wire, and electric devices to resort to for a hairstyle we wanted…ladies resorted to paper and fabric! I have no idea when “rag rolls” and “curl-papers” originated in history, but my first introduction to this type of pinning up one’s hair was in high school when I read Charles Dickens’ “Oliver Twist”. There are several references to “curl-papers” in both Nancy’s and other ladies’ hair throughout the book, with the most prominent citations in Chapter 13 (find it yourself here). Just think – this book was from circa 1840! It might be the best looking way to set curls (hubby thinks I look rather funny in it), but it is natural, easy on the hair and head, and requires only very simple and readily available supplies. Little or no money is needed to try it out…only a little time. This is the final part, number 3, to my post series on easy and simple ways to stay comfy, cozy, and effortless but authentically vintage when it’s time to unwind. Post number 1 is a 3 hour, bias-cut nightgown and post number two is a fleece, very coat-like housecoat. The pictures below show my finished style after using my hair curling method. Enjoy the following tutorial! 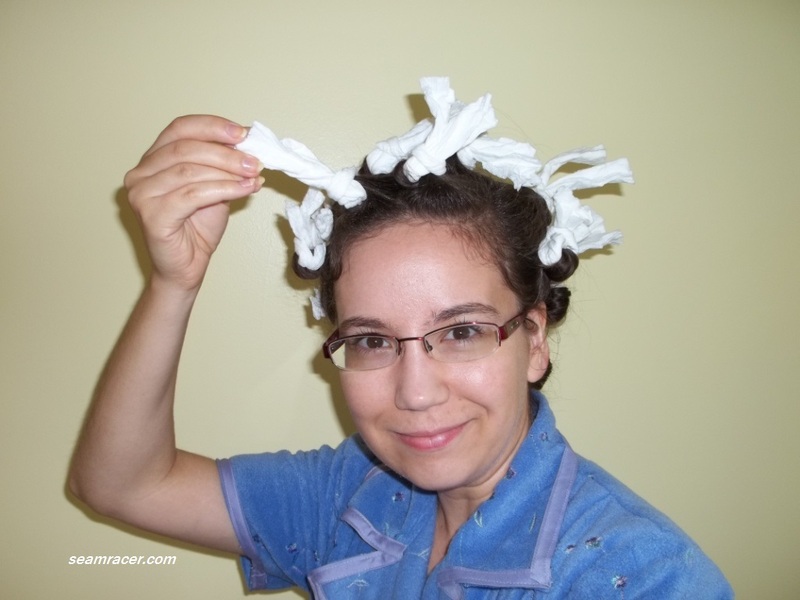 This might sound weird to start off with, but I will demonstrate how to make your own “curlers” using something menial but soft and readily available – toilet tissue paper. This is how Cecil first showed me. In “Oliver Twist” and Jane Austen times, women used paper – and you still can try this with strips cut from a lunch bag or such if you’d like. In addition to toilet paper, you can even use paper towels. I also have “curlers” made from real rag portions or scrap fabrics, the reason this kind of set is often known as “rag rolls”. However, learning to use toilet tissue paper means wherever you go, you’ll never lack the necessary tools for lovely curls…just sayin’! 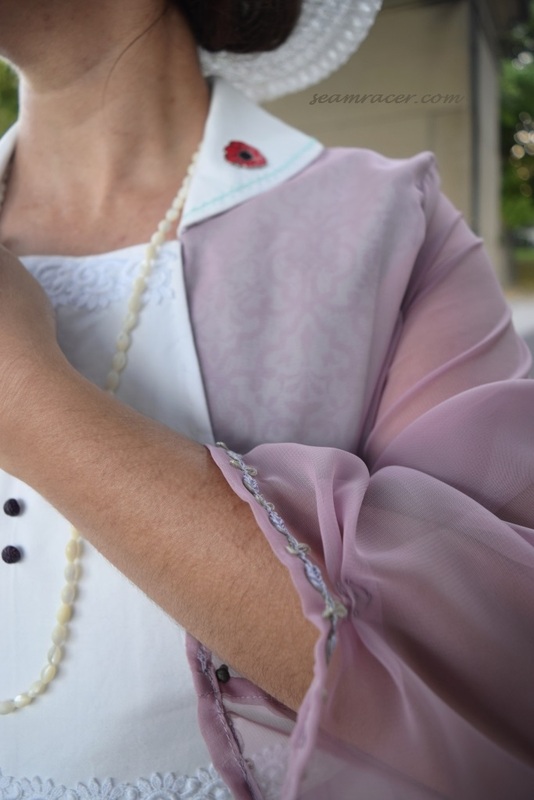 Later on you’ll see my curlers made from velvet leftover from this blouse, but just basic cotton is actually the best material, in my opinion, for rag rolls. You don’t want to use any material silky or slippery in feel. You want a fabric that will somewhat “stick” to itself. 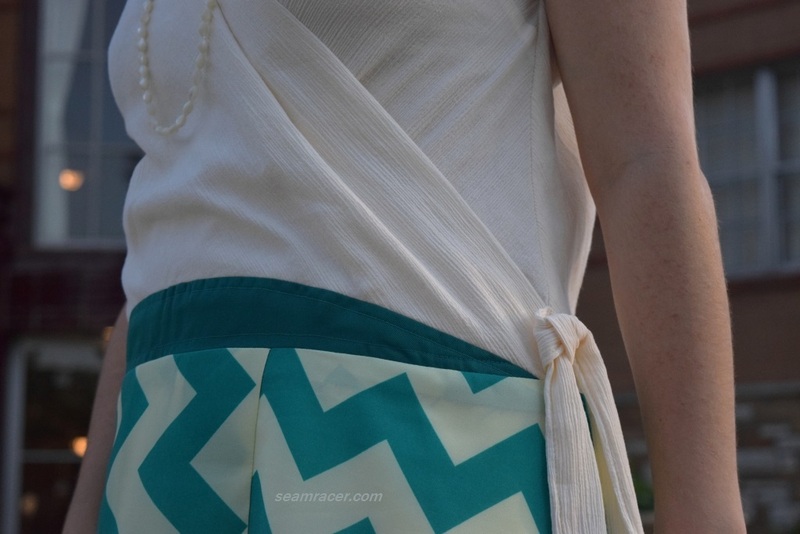 Here’s your fabric scrap pile’s big opportunity to become useful! Best perk ever – this set is the most comfortable to sleep through the night in that I have found yet! This is due to the fact my method of rag rolls is not just wrapping hair around a strip of fabric and tying a knot. Who wants to sleep on that?! My rag roll method is all about making the perfect “curler” that eliminates any knotting, tying, or any little bird’s-nest of hair to sleep on overnight. First off, you need to start with a rectangle that is about 4 inches by 12 inches (or 3 squares of toilet tissue paper to be exact). You can make your rag rolls longer (maybe 15 inches) if you want them to be a bit easier to work with and you can also make them wider (maybe 5 or 6 inches) if you want thicker “curlers”, but I would not recommend going smaller with the proportions. You are going to take this rectangle and fold it first in half towards you, long wise (step #1 & #2), and then in half again (step #3). In other words, the rectangle is being folded into fourths along the length. This done, you hold both ends and twist only 3 times. A semi-twisted rectangle piece, not a tightly wound ‘rope’, is the ideal. A few twists of the wrist while holding each end is all it takes. Now, put your finger into the middle and fold the whole piece in half, keeping it twisted. Voila! You have your curler! You can do this as you go to see how many you’ll need or you can do about a dozen and work with that. Now, I usually only do my rag rolls when my hair is completely dry or partially dry. Starting off with wet hair would only soak the rag scrap and prevent your hair from ever drying (unless you sit under a hood hair dryer for a long, long time). 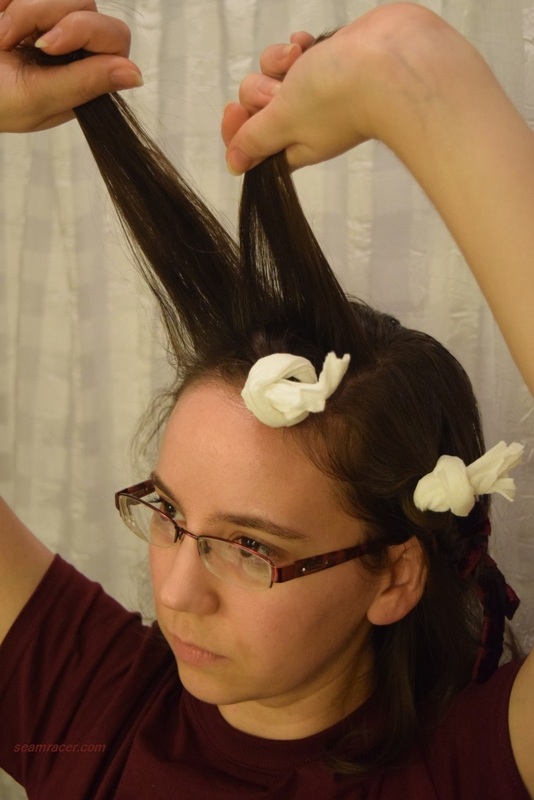 Wet hair with toilet paper “curlers” seems like the formula for a gunky mess, so make sure your hair is dry for this option. My hair is naturally curly so maybe starting off with hair completely dry will not work for everyone without adding on some sort of setting lotion or the like…I don’t know, I’m not you! You’ll just have to try and experiment to see what works best for you. The same thing goes for the portions of hair you want to use – you’ll have to experiment. I usually grab a portion about 2 inches square from the scalp and always curl under (unless I want a 60’s ‘flipped end’ style). Now’s the time for some rapid fire quick tips. Smaller portions make tighter curls, larger portions make looser curls. You can also twist your portions of hair like you did for the rag “curlers” – this helps the hair stay in place but also makes for a loose, wavy sort of curl. Rolling in with the hair at a 90 angle or more from the scalp creates volume, versus rolling in at a 45 degree angle which creates a curly style that lays closer to the head. Rolling in all the way to the scalp creates more, tighter curls while rolling only half way up to you scalp leaves a flat crown with curly ends. There are so many possibilities for changing it up for a different look! I like to make the front side portion as tighter, smaller portion curls rolled in a vertical angle. The same goes for the bottom back hair along the nape of my neck. These two spots come un-curled easily over the course of a day and I like tighter curls falling down one side of my face. My hair is cut in long layers, with the front angled down so curling this way pairs up well with my haircut. Once you have a hair portion, hold the end of your hair because you’ll start curling there. 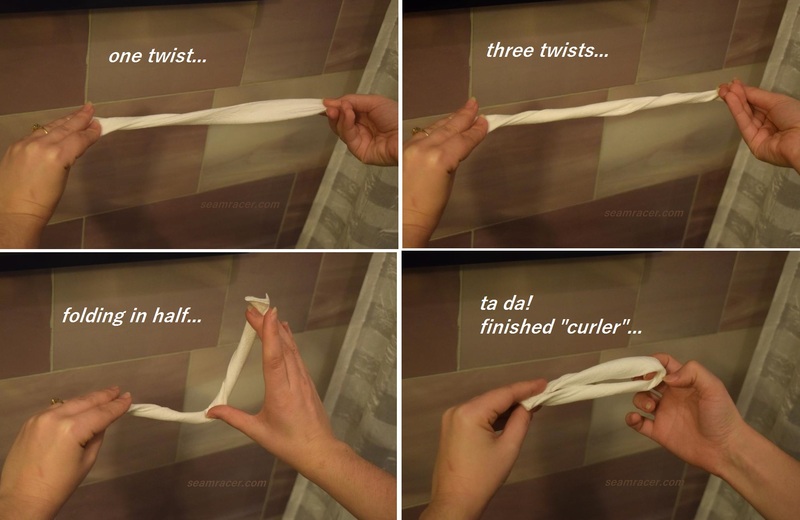 Find the middle of the rag “curler” (still keeping it twisted and looped in half) and put your other finger over it. Roll the end tips of your hair twice over both the “curler” and your finger. Then pull your finger out and keep rolling in from there. Having your finger over the rag roll at the beginning of the curl keeps the tips of your hair from being kinked or rolled way too tight. Otherwise you’ll end up with a finished curl that has an end which is very frizzy and terribly ugly (called “cow licked”). Believe me, I tried a set without my finger there at the end just to see what it would do and won’t do it again! Once you’ve rolled up as far as you want to go, take your two “pinchy fingers”, thumb and index finger, and peek them out through the loop at one end of the rag “curler”. Grab the two “tails” at the other end of the rag “curler” and either stuff or pull them through the loop. It takes practice to get the loops just right because if they are too big they won’t hold the curl or tails. If the loop is too small, well…it won’t work at all either, especially if you’re using toilet paper (it breaks and you have to start over). Again, this step takes a bit of practice. With all curls looped closed and hair pinned up, I’m ready for bed! After a night of sleeping sometimes a few curls do come undone. However, they almost always survive intact well enough to do their job. All taken out, below at left is what my rag rolls look like un-combed. After a thorough brushing with a bristle brush, this (below right) is my finished hairstyle. The curls do relax a bit over the course of the day, more so with extra brushings, but generally last me for two days. Of course, as my hair is naturally curly, it probably takes to the set better than others might find. This hair set works for many decades depending on how you use it. A loose set is something I can use for the 40’s and especially 50’s, while a tight set I use for both the 30’s and the 80’s. Look what fabric can do for your hair! Please do let me know if you try this and how it works for you. It took me several times of experimental sets before I felt like I had it down and was doing it decently enough. Please do ask me if you have a question – whether it’s something you need clarified or whatever! P.S. I will have a “short and sweet” version of this hair curling tutorial on my Instagram, just done with velvet rag “curlers” rather than the toilet paper used in this post. Also, in case you were wondering, the printed tee I am wearing in some of my pictures is my newest Agent Carter acquisition…to see the whole thing, go on my Instagram post here and figure out the meaning to it!